The Provedore Group P/L is the marketing and sales arm of the Fresh Cheese Company P/L and Montana Foods P/L. Both manufacturing companies have been operating for over 20 years and together with The Provedore Group employ nearly 140 staff. The complete product portfolio offers a wide selection of high quality Mediterranean style cheese, commodity cheese, yoghurt, flavoured cream cheese, dips, pesto, antipasto, salsa’s, pasta sauces, mayonnaises, chilli sauces, stir fry mixes and vinegars. All products are available in retail, food service and industrial sized packaging. The Fresh Cheese Company is predominantly a manufacturer of multi-award winning high quality Mediterranean style cheese. For over 20 years the company has evolved from a suburban cottage business into a major player in the specialty cheese industry in Australia. Initially the business was a two-man operation, processing 250 litres of milk per day. Today the Fresh Cheese Company manufactures a wide variety of Mediterranean style cheese products under the Mamma Lucia Cheese and Puglia Cheese brands and employs nearly 90 staff and processes approximately 70,000 litres of milk per day, approximately 18 million litres annually. Jaycroix Cheese is a division of the Fresh Cheese Company. Located on Sydney’s northern beaches, Jaycroix Cheese manufactures a large selection of fruit and savoury flavoured cream cheese products under the Jaycroix Cheese, Apollo Cheese and Mamma Lucia Cheese brands. These products have proven to be very popular, not only in the domestic Australian market, but also throughout north and south Asia, Oceania, the sub continent and the Middle East. Montana Foods was established as a small family business, focusing on quality and service. Originally manufacturing just dips and pestos, the product selection has developed dramatically over the years due to customer demand. Our passionate and talented team are dedicated to the art of manufacturing award winning gourmet products, using only the freshest natural local ingredients, handpicked and delivered daily from farms across the country. Through continuous research and product development new innovative products are regularly created. Export sales for all product lines have been developed over the last eight years and our products can now be enjoyed in over 30 countries, through direct and indirect sales. Our products are supplied to airlines, cruise ships, restaurants, hotels, supermarkets and as ingredients to other food manufacturers. Private label and custom manufacturing are also a predominant part of our business. Both the Fresh Cheese Company and Montana Foods currently manufacture private label products for companies operating in both the retail and food service industries, domestically and internationally. All our dairy products are manufactured using non-animal rennet, making them suitable for vegetarian consumers. 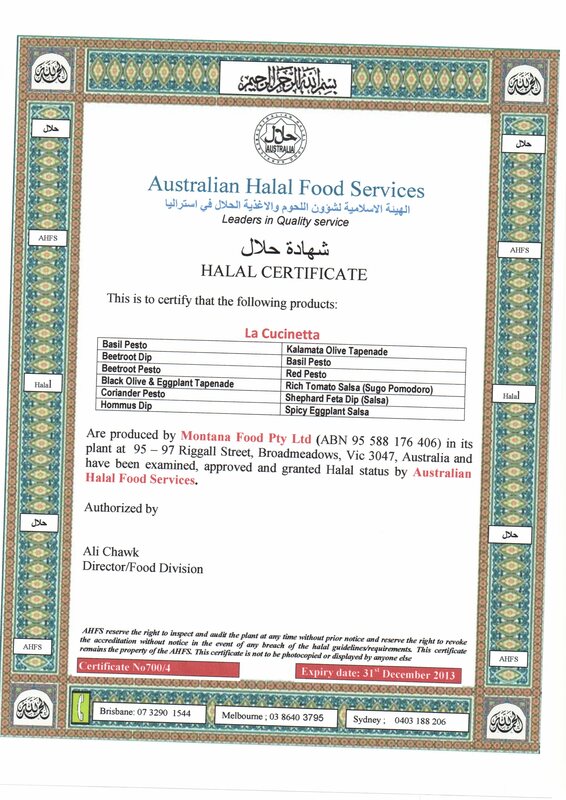 The Provedore Group, Fresh Cheese Company and Montana Foods are all proudly Australian owned company.